← Bento from Beyond the Grave! Our trip to Singapore was essentially a giant food trip. We wanted to sample as much as we could of Singaporean cuisine so we diligently consulted travel books and brochures. After all that research, one place we knew we had to visit was Makansutra Glutton’s Bay. Located in the Marina Bay area, Glutton’s Bay boasts of 12 famous hawker stalls who have been crowned as the best by food and culture-centric media and publishing company Makansutra. 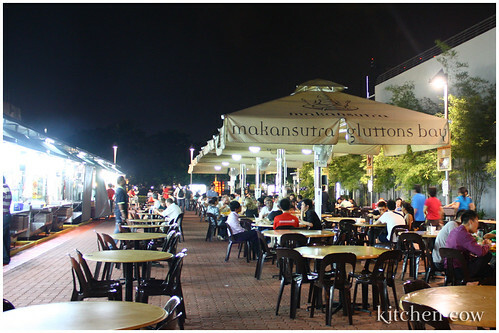 Here, you can grab your pick from the various hawker stalls then enjoy them al fresco under the stars. 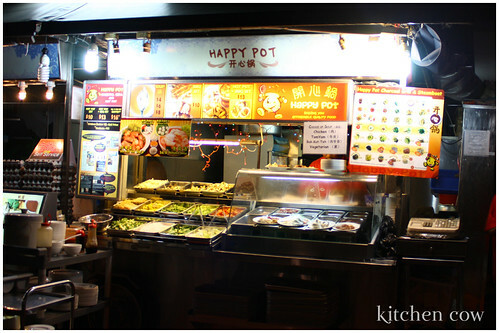 One of the stalls we visited was Happy Pot, a stall specializing in hotpot and barbecue. If you get the hotpot, you can choose between a Tomyam and a Bah Kuh Teh soupbase. You also get to choose what to put in your hotpot among the veggies, seafood and meat. 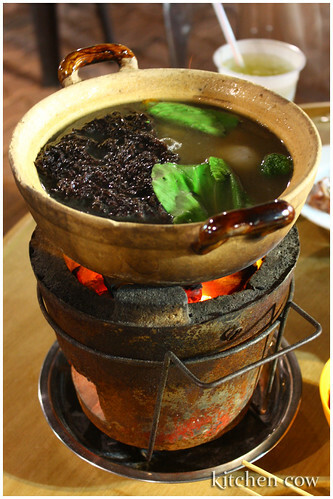 We went for the Bah Kuh Teh hotpot, a light peppery soup base made by boiling pork, whole garlic heads and pepper. Aside from the veggies and meat, some seaweed was also thrown in, infusing the lightly-flavored soup with a deeper flavor. 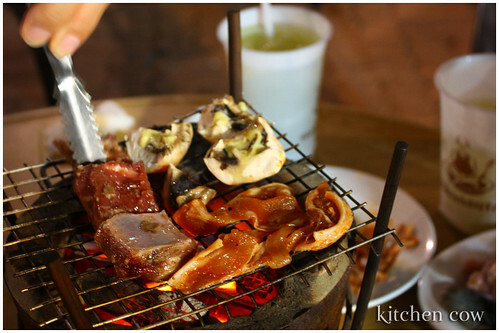 Aside from the hotpot, we also got a barbecue set which came with an assortment of meat, seafood and really yummy, buttery mushrooms. 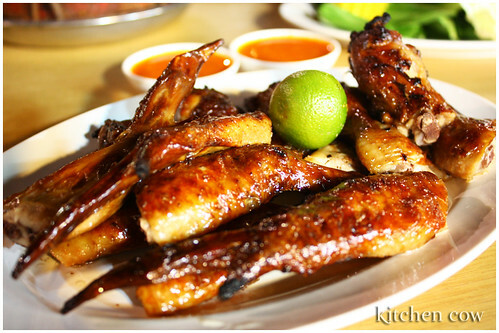 Another stall we visited was Huat-huat BBQ Chicken Wing and Fried Carrot Cake. It sells, well, BBQ chicken wings and fried carrot cake. I must confess, we didn’t really want to buy chicken wings but because some of the other stuff we wanted to try weren’t available from the other stalls, we figured we could get some just to have something additional to nibble on. Thank god we got some though. It was nicely roasted with a very tempting barbecue flavor from the skin to the meat. It was complemented by a citrus-chili sauce that made it even better as the citrus taste complemented the bbq flavor so nicely. We wanted more meat (MEAT!) 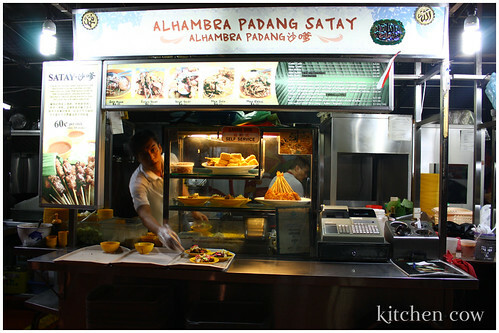 so I stopped by Alhambra Padang Satay to grab a couple of sticks of satay. I wasn’t really feeling the satay I tried before so I wanted to give it another shot. I figured this was a good place to get some since it’s recommended in one of our food guides. 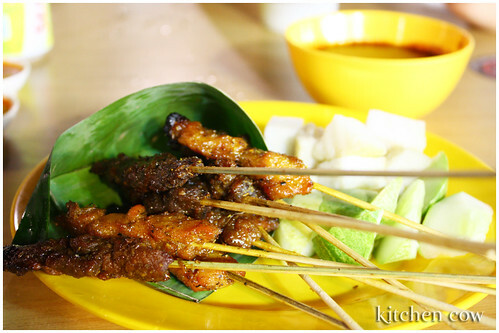 What we got was a plate of assorted satays—beef, chicken and mutton. It was served with sliced cucumber, doughy little cakes and peanut sauce. True enough, it was better than the one we had at Food Republic. To cap off our meal, we decided to grab some Kopi at one of the Kopitiam stalls, still at Glutton’s Bay. So we’d have something to munch on, we grabbed a plate of Banana Tempura. These ripe banana fritters was a nice way to end the meal. It was reminiscent of Philippine Maruya, only the batter was lighter and the bananas they used were sweeter than the saba bananas used for the local treat. It was served with a Kaya dipping sauce that went well with the yummy, warm and crisp tempura. I had mine with some Kopi-C, a local pulled coffee mixed with condensed milk. Ah coffee. No matter where I go, I shall always find comfort in this heartwarming brew. Definitely a perfect end to a meal I shall always remember fondly. 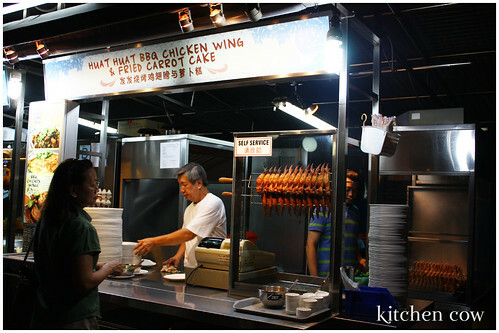 this sounds exactly what i want when going around looking for eats in s’pore: everything in one place! when i found the website i was ecstatic and quickly jotted down glutton bay on the itenerary. and now thanks to your pics, i’m even more excited to go! Oh god, now I’m going to have to buy some crabs to fry with peppers and salt and eat with tons of rice. I love Singapore for the food! Ahhh! All the food we weren’t able to try when we were in Singapore! The next visit will definitely be a food trip! Ay sobra, go there for dinner so you can have those sparkly lights. Did you see the other walking tour suggestions on the website? Wala lang kaming oras but they sound so nice! I like the Bah Kuh Teh there more than the one I made here! Mine was kinda failish 😛 But at least I get one more chance, I bought two spice packets 😀 Mebbe it just needs to be stewed longer. Mmmmm…now I want some too! I think Singapore was made for food trips. I so want to go back, I know there’s a lot more to eat that I missed out on. Me too! I want to eat more and more! Glutton’s Bay is good for the fact that it collects all the recommended food places into one area, but it can get really expensive! 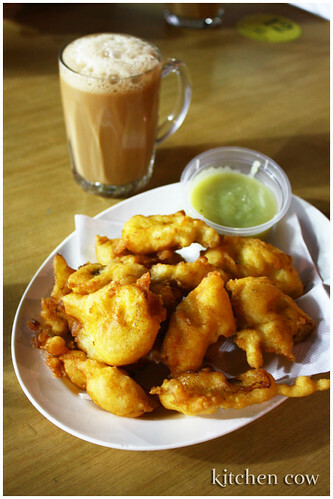 The doughy cakes with the satay should be rice cakes – also known as ketupat here. Glad you had fun here! Oh! Thanks for the info raydance! Glutton’s Bay was a really good experience for me. It was only unfortunate that some of the food I wanted to try, like the Roti Prata, were already sold out by the time we got there. Still, it was satisfying enough. I know I’d love to go back there if / when I visit Singapore again.